House: Bloodline of the Dwarf King. History: Hrothgar became king at 14. It was 40 years after the events of the Demon war that his farther King Teric died at the age of 65. King Teric helped kill a Dreadlord, at the time he was only 25. 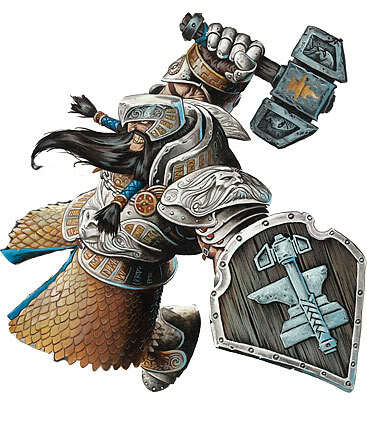 King Teric became a legend from how long he fought the Dreadlord, but what really put him down in history was he got a wound that would kill any other dwarf and survived. King Teric had lived with his wound with only small amounts of pain in till the day Hrothgar was born. When Hrothgar was born the pain suddenly became more and more unbearable. By the time Hrothgar was 6 every mouth he will hear his fathers screams of pain. When Hrothgar was 9 his farther started to get better and stayed better for 2 years. During all of this Teric tried to teach Hrothgar everything he could about being a King Hrothgar will need this for later on when it will be just him. 2 years passed and things got bad for Teric he no longer screamed much because he was use to it but the pain stroke at lest once a day becoming very bad. Hrothgar had no cheildhood because of this he was raised at much faster then should of been. He started sparing with people who where 30 when he was 5. At 9 he form was amazing and he even managed to best his teachers a few times at the young age of 9, but he lacked the strength. Teric managed to live up until Hrothgar was 14. He suffered though much pain, and had a permanent impacted on Hrothgar for the good and the worst on his son Hrothgar. Hrothgar grow up hating Demons even though he never seen them. Even though he not a Demon Hunter he will gladly fight a Demon any day. Hrothgar didn't get to go to the funeral of King Teric because he was to busy becoming king. It was also a Dwarf tradition that the hair become king as fast as he can. Hrothgar only messed up a few times as a young king. One of which was questioning why Dwarf like to just mine all day... you do not question that. Hrothgar has had little problems as king. The people respect him very much as a warrior, and he has a good head on his shoulders. Hrothgar try's and not change something if he not needed. He only makes a new rule if a big problem and he try's to be as fair as he can with these rules. Hrothgar likes minerals as much as any other Dwarf but never taxes them from his own people for his own hobbies. Hrothgar made his makes his own armor and weapons from minerals he mines himself. Hrothgar learned d a few things in his training. One was that the weapons everyone said would be imposable to wield in one hand where easily for him to wield one handed and with a shield. He learned how to use weapons 2 times his height, how to repair armor, make his own armor, and after 20 years of practice he learned one of his most valuable skills, he learned how to duel wield 2 handed weapons. Personality: Hrothgar likes sparing people and will challenge to a friendly spare if he thinks it will benfit one of them to learn a few new things. Hrothgar likes making jokes and laughing at others if there where funny. Hrothgar also loves Mining, blacksmithing and Fighting. What comes first to Hrothgar is the safety of the Dwarf people, second is killing any Demon that dares show it's face in the name of his father. Even though he hates the Demons he never became a demon hunter what he always told him self was. "If I cant bash its head in with a Weapon then ill just distracted it by yelling at it." Hrothgar wouldn't put the Dwarfs in front his revenge though but he will help out the races he allied with to take one down. Hrothgar knows the strength of Demons well enough to know it will be his death wish to take one on by himself also. Fighting Skills: Since Hrothgar as been sparing since he was very young, he is use to wearing heavy armor and can put on much more if wanted. Hrothgar also learned how to Duel wield 2 handed weapons. When Hrothgar wields his weapon with both hands, he hits much harder. Hrothgar can move fast for a Dwarf, however when Hrothgar is fully armored he moves a lot slower.